Shawn Quirk's Air Conditioning Installation Project 2 — The New Millennium.... Falcon! 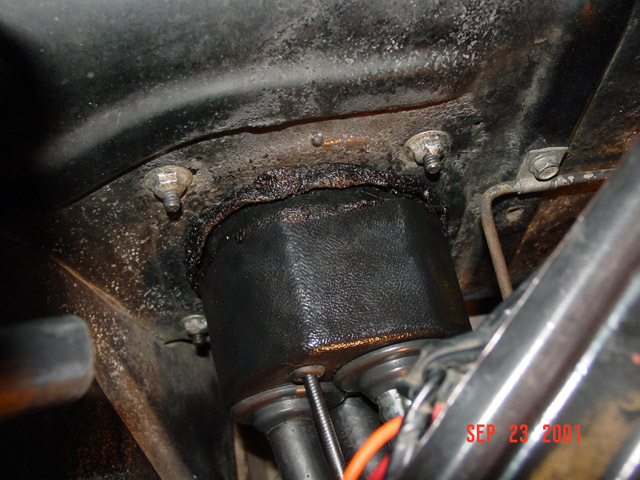 Facing the engine from the front of the car, the compressor belt tensioning assembly (consisting of an “eccentric” and 1 1/8” belt pulley) was designed to ride to the left of the water pump, under and to the left of the upper radiator hose. Vintages' 289/Mustang drawing (reference picture: Comp&MountDrawing) shows something different than what I have, being, the upper radiator hose bending out of the thermostat housing at a 45 degree angle that mine does not have. These are just not the same hose paths, so as designed, the Idler and belt literally rode on the radiator hose; not good. Ultimately we moved the idler assembly to the right of the water pump and designed my own belt-tensioning mechanism. The eccentric they provided put the pulley so far forward that it could not be modified to work either, so we pitched it and used a fabricated spacer (reference picture: Comp #1). I wish I took a picture of the mount before we modified it, but you can see the drawing showing the original design, as well as the in process modified mount (reference picture: Comp #2). Look in the lower right corner of the drawing; you can see it’s a major modification we made to the mount. Possibly a 65/66 thermostat housing and radiator hose route are different than my 64? Again, who knows. Note that our idler pulley pushes on the back side of the belt (reference picture: IdlerPush) not from the inside like designs I’m familiar with. Issue there? Don’t know. We slotted the compressor mount to allow the idler pulley to slide to allow for belt tension adjustment (reference picture: IdlerSlot). It’s not a design I’m familiar with, but it works! If you have power steering (PS), then you will need a crank-pulley with three belt grooves, one groove each for PS; alternator/generator and water pump; and the A/C compressor. The crank pulley that Vintage provides (Vintage part number PM11) has three grooves you would need, however, once the PM11 is installed on the crank, its grooves are WAY out beyond the OEM location of my alternator andPS belts, i.e. too far away from the block. I neglected to take a picture while the PM11 pulley was installed, so I lined the PM11 off to the side of the OEM pulley, in alignment as it would be if installed, and took a picture that shows the differences in the groove alignment. You can see what I mean (reference picture: Pulley). Not even close. I simply did not want to modify or move the alternator or PS pump to make them align with the Vintage pulley, it could be done, but too many issues. So, look closely (reference picture: Pulley #1) and you can see that my stock/OEM pulley had an empty groove in the middle. That is the groove I targeted - and ultimately used - for the A/C belt. I still have the PM11 pulley; its kind of large for a paper-weight, but I leave it on my work bench as a reminder of the project, or to prop the back door open when I need circulation in the garage. Targeting the middle groove on the OEM pulley differs from using the forward (front of car) groove on the Vintage (PM11) pulley, which is the groove that Vintage calls out for use on their Mustang drawing. Look at (reference picture: Comp&MountDrawing) and you can see what I mean. Using the OEM middle groove brought about multiple, nerve wracking measurements including angles for proper belt alignment. Lining up everything so the compressor belt hits this groove squarely was tough. Keep in mind, I have only basic measurement tools; a quality ruler, a cheesy slide caliper and a steel straight edge I borrowed. Ever hear the expression "Measure Twice, Cut Once"? Let me tell you, measured dozens of times. Ultimately, I scrubber the way they bolted the compressor in the mount too. For proper alignment I had to move the compressor back in the mount, away from the front of the car. We cut a square area (reference picture: Comp #2) to allow the compressor to sit back in the mount, then ran some high-grade bolts all the way through the mount and both ends of the compressor (reference picture: Comp #1). Normally, the forward flange of the compressor is bolted in front of the mount, where it now sits behind it. We also had to measure and make some custom spacers to fine-tune the position of the compressor, relative to the belt grooves. You can see those in (reference picture: Comp #1). Again, the drawings left a lot to be desired, neglecting any clues or any of the little details that would save you from wasting a lot of time. 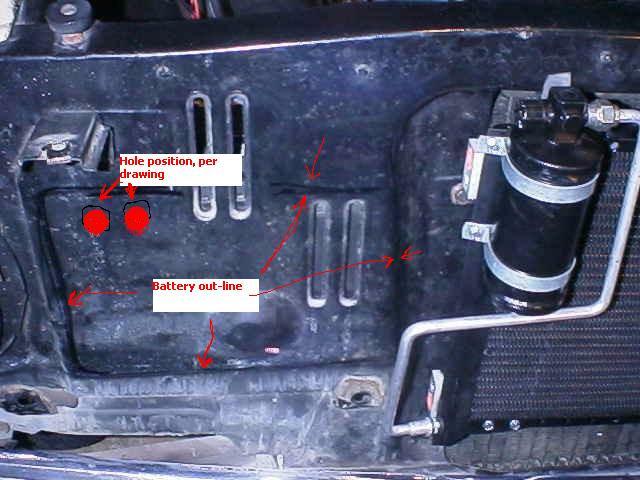 As an example, the A/C and heater hoses end up coming through the firewall where the OEM fan-blower was, through a plastic bulkhead (reference picture: below) that fits around the hole left by the OEM fan motor. 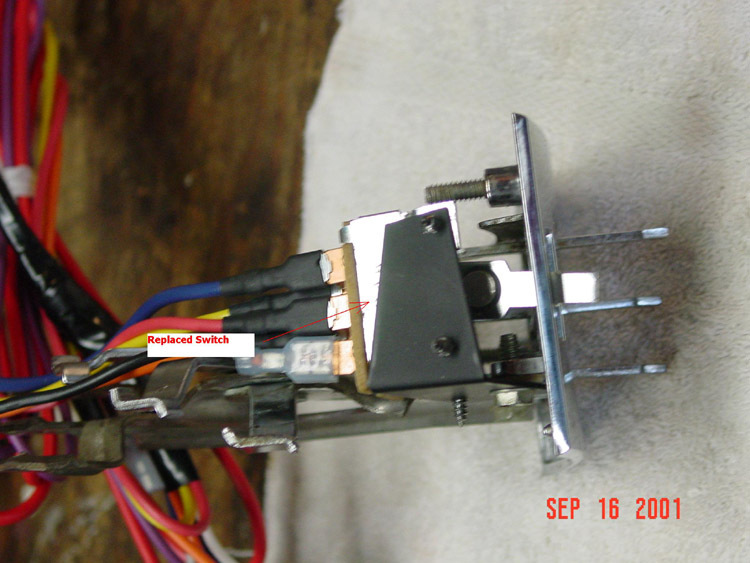 It’s a clean little bulkhead that attempts to align the hoses relative to the holes that were used to bolt down the OEM fan, but in the real world, the way the hoses come through the bulkhead vs. the way they connect to the evaporator are not in alignment. Note that there is a flat spot on the top of the bulkhead. That flat spot should be about 35-40 degrees to the right, but to align the hoses to the connections on the evaporator picture (reference: EvapPlumbing) it has to be twisted to the left. It’s a minor issue, one I’d write off as ‘expected’, and with a little effort it’s no big deal, just annoying in the final stages of completion, and then some extra sealer required to make it air & sound tight. Oh yeah, the connection in the upper left in this picture (it’s the A/C inlet hose with a thermostat sensor) needed to be adjusted; the part with the little white plastic cap was pointing up and there was NO WAY to make the hose connection. I had to remove the insulation and point it down, HOPE that this thermostat thing did have to be pointed up to function correctly – what did I know?!? (Ultimately, it didn’t matter). “Challenges” mounting the condenser (in front of the radiator) caught me completely off guard. It looked so good. The condenser comes with the drier already assembled on to it, and looking at the way the drier was mounted, it looked like a "Sure Fit" to me, a very clean assembly (reference picture: DrierMount B4). The condenser and drier assembly should fit within the recessed area of the radiator core-support, where the radiator sits. To get access for the install, I removed the grill, bumper and the valance (valance? Whatever that painted piece that sits between the grill and bumper is called). BTW, no need to remove the bumper. Then I swung the condenser up to its position and CLUNK, another "No Fit." Low and behold, the drawing shows a different configuration of drier and tube connections. In the drawing there appears to be hoses routed between these parts, not the tube and connectors it actually has. It appears to me they upgraded this assembly, but if I had to guess (sarcasm here) they never measured after the modification to see if it still fit. The clean looking drier mount, tubes & connectors are nice, but they add 1 3/8" to the overall width of the condenser assembly, making it 1 3/8" too wide for the recess area (reference picture: Drier pic below). Note that the left edge of the ruler lines up with the edge of the recess (which you can see as well) and the way the tube extended beyond the radiator recess. I don’t recall seeing Falcons with different core-support designs, but then again, FoMoCo may have changed one of their ‘Better Ideas.’ Bottom-line, if you remove the drier, the condenser and its brackets fit into this relief area. Also, where they want to drill through the core-support to route the hoses from inside the engine compartment to the condenser, you'd drill two holes right into my battery; Hummm, not a good idea. The red ‘holes’ in this picture (reference picture: BatteryLine) represent where they say to drill, and you can see where I outlined the battery (red arrows). Besides, it would be next to impossible to route the hoses their way, even if you could bend the very-stiff hoses between the battery and the radiator core-support. For the record, the battery and tray are OEM, never moved. Lastly, instructions say there is already one hole there, from the factory. Look at the picture; nope.